Preparation Snap open tamper proof clip & dispose of immediately, safely, away from children. Do not use if the clip has already been broken off. Hold the top of the can with both hands, push both thumbs under the lip and push up to open the lid. Lift the lid, the spoon is held inside. Open the foil seal by pulling back on the easy open tab carefully & safely, then dispose of the foil. A Wash hands, then sterilise your feeding utensils according to manufacturers instructions. B Boil freshly run water & leave to cool for no more than 30 minutes. Do not use artificially softened, or repeatedly boiled water. Measure the required amount of water (feeding guide) into a sterilised bottle. C Using the scoop provided, add the correct number of levelled scoops to the bottle. Use the straight edge inside the lid to level each scoop. D Secure on a sterilised cap and shake well to dissolve the powder. Remove the cap and replace with a sterilised teat. E 37°C Cool to a natural drinking temperature. Always test the temperature of the liquid on your wrist. Feeding Guide (6 - 12 Months) (1 level scoop = 4.6g). Add 1 level scoop of powder to each 30ml of water. From 6 months your baby will need about 600ml of Kendamil Follow-On Milk per day as a drink or in food. Talk to your health professional if you need more advice. Amount of freshly boiled and cooled water per feed (ml): 150, Number of scoops per feed: 5 Amount of freshly boiled and cooled water per feed (ml): 180, Number of scoops per feed: 6 Amount of freshly boiled and cooled water per feed (ml): 210, Number of scoops per feed: 7 Important Feeding Instructions: Use the correct amount of levelled scoops as directed. Using too much, or too little can make your baby ill. If your feed has not been used within 2 hours, we recommend that you throw away and start again. Do not add food products such as cows milk to your baby's milk, and do not re-heat in a microwave. IMPORTANT NOTICE: Breast feeding is the best way to nourish your baby. 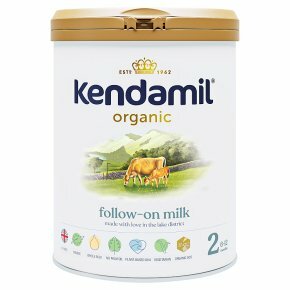 We recommend that you only use Kendamil Organic Follow-On Milk on the advice of your doctor, pharmacist, midwife, health visitor, public health nurse, dietician or other healthcare specialist, based on your baby's individual needs. When bottle feeding do not allow prolonged contact of milk feeds with your baby's teeth as this increases the risk of tooth decay. Make sure your baby's teeth are cleaned each night after the last feed.